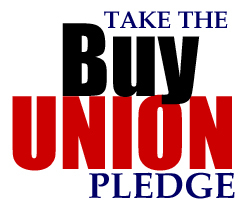 The 10 days following Thanksgiving are designated by the AFL-CIO as “Buy Union” week to encourage union members to look for union-made goods and services when buying Holiday gifts and other items. Supporting union-made products helps keep good jobs in the community and could have the added benefit of encouraging increased manufacturing at home. That’s why it’s so important for our union families to focus their purchasing power on the goods and services created by union brothers and sisters. Holiday shopping traditionally kicks off on “Black Friday”—designated as such because it’s the timeframe when many retailers move from red ink to black on their balance sheets. Shoppers will find plenty of “bargains,” but union family shoppers will want to look beyond foreign-made electronics, trendy toys and gadgets to find enduring goods that are union made, or perhaps a gift card for union-productions, such as movies or sports events, or union made food stuff—there are many union-made candies, baked goods, spirits and specialty items. The AFL-CIO Union Label & Service Trades Department suggests you start your shopping list with a visit to:www.unionlabel.org, and click on Union Products. If you can’t find what you’re looking for there, move on to the websites of individual unions that show up as links on that page. Entertainment & Events: American Federation of Musicians (www.afm.org) • Candy, Baked Goods & Spirits: Bakery, Confectionery. Tobacco Workers and Grain Millers (www.bctgm.org) • Mobile Phone Service, Appliances (www.iue-cwa.org), Holiday Cards (www.ppmws-cwa.org): Communications Workers of America (www.cwa-union.org) • Glassware: Glass, Molders, Pottery, Plastics and Allied Workers (www.gmpiu.org) • Air, Rail Travel, Appliances: International Association of Machinists (www.iamaw.org) • Movies, Live Stage Entertainment: International Alliance of Theatrical Stage Employees, Moving Picture Technicians, Artists and Allied Crafts (www.iatse.org) • Appliances, Lighting: International Brotherhood of Electrical Workers (www.ibew.org) • Automobiles, Automotive Products, Games and Toys: United Autoworkers (www.uaw.org) • Kitchenware, Sporting Goods, Paper Products (Gift Wrap): USW (www.usw.org).